When the Country Music Association's celebration, the CMA Music Festival, invaded Nashville June 8-11, a number of downtown locations became temporary, converted vehicles for the music. The city's NFL venue, Nissan Stadium, had roughly 50,000 fans entertained by the likes of Thomas Rhett, Maren Morris and a surprise performer, Garth Brooks. Luke Bryan delivered a rooftop concert from Tootsie's Orchid Lounge to throngs of yellow-shirted hockey fans on Lower Broadway before the NBC telecast Game Six of the Stanley Cup Finals. Luke Combs led a "Hurricane" sing-along at the Radio Disney Country stage inside the Music City Center, Jon Pardi packed thousands into small quarters for a show at Riverfront Park, and Rounder singer-songwriter Sean McConnell delivered a short, impactful set at the converted driveway of the Hard Rock Cafe. Nearly every venue at the CMA Music Festival is a makeshift stage, essentially transforming a hillside, a football field, a park or an exhibit hall into a temporary concert showcase for the 80,000 or so fans who annually trample into Nashville's downtown for a four-day celebration of country music. Big & Rich, Sara Evans and Dan + Shay headlined the Cracker Barrel-sponsored concerts, which some within the industry viewed as a risky move. The free events -- which also featured Hunter Hayes, Kellie Pickler, High Valley, The Oak Ridge Boys and Billy Ray Cyrus, among others -- went head-to-head against the CMA's established stadium offering. They were announced late enough in the buildup to the festival that there was little time left to promote them. Big & Rich were, admitted John Rich, "apprehensive" when they were first asked to play Ascend. But it didn't take long to get onboard. "My first question was, 'Why would people come here if they could go to the stadium?' " noted Big Kenny. "They said, 'Well, this stage is going to be free.' "
Big & Rich, who have endured empty-pocket periods, figured Ascend was perfectly suited for a blue-collar audience. "We know what that's like, and we've got to play for them, too," said Big Kenny. The CMA incorporated Ascend, which opened in July 2015, into its daytime schedule last year with uneven results. The venue is several blocks outside the festival's historic footprint, and with numerous other events happening at the same time -- some of them in air-conditioned quarters -- Ascend was visibly overstaffed. By shifting the shows to the nighttime this year, it allowed visitors the luxury of camping out for hours at a time on the lawn or in the seats down front without feeling like they were missing other attractions. And with highs in the 80s for the bulk of this year's festival, the atmosphere for those evening shows was unusually pleasant. "Not to knock the Riverfront Stage, but I think I lost more calories a couple years ago playing the Riverfront than I had working out all year," said Dan + Shay's Dan Smyers. "It was so hot. We were playing the 11 o'clock [a.m.] or the noon slot and were baking up there on the stage." The amphitheater was also better connected to the festival footprint this year. A Forever Country daytime stage was set up on the back side of the amphitheater, providing a more cohesive foot-traffic link to Riverfront Park along First Avenue. With Tracy Lawrence, Terry McBride and James Otto among the stage's performers, that temporary venue sent a clear message to the thousands crossing the pedestrian bridge over the Cumberland River that there was music happening in that section of the downtown. "It embodies the whole Nashville brand," said Dan + Shay's Shay Mooney of that stage's development. "I remember when we were [new], we walked out on Broadway, and you heard all these incredible, incredible musicians, and it's an unbelievable thing. This is just the heart of Nashville reaching out. They branched out and put a few more stages out, and there's great music everywhere, like there always is." "Everywhere" is not an overstatement. Street musicians played along the downtown sidewalks and the foot bridge, loud sounds tumbled out of the bars along Lower Broadway, and music blasted from some new retail ventures, including Florida Georgia Line's restaurant, FGL House, which officially opened June 5. Jason Aldean gave a post-CMT Music Awards concert outside of the Country Music Hall of Fame, Blake Shelton delivered a pop-up show on short notice at the Wildhorse Saloon, and Lady Antebellum taped a SiriusXM show by playing its new album Heart Break in three installments at another temporary venue, the Budweiser Dome. All the traditional elements of CMA Music Festival were there. Artists signed autographs, threw fan club parties, organized benefit concerts and sports competitions, and played official venues that ranged from the makeshift Chevy Stage in Hall of Fame Park to the big stadium stage at Nissan. Ascend is, in essence, the new kid on the block, but of all the official stages, it's the only permanent venue that was created with music as its first order of business. With Cracker Barrel signed to sponsor the venue in 2018 and 2019, the first-year attendance figures provided a decent base to increase its impact in the coming years. And while fans seemed to appreciate its obvious amenities, the artists enjoyed their own benefits. The venue offers a green room, real bathrooms, a temperature-controlled backstage and the chance to do formal sound checks, a distinct contrast to many of the other stages. 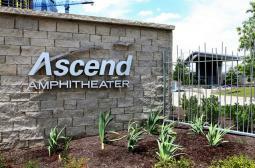 As an option for fans who can't make it to the stadium, Ascend's role in the 2017 festival may have established an invaluable precedent for future CMA Fest incarnations. "I love how much work they've put into continuing to grow CMA Fest," said Hayes. "They're not settling into 'That worked, let's just do that again.' There's always something new." Copyright © Ascend Amphitheater. All Rights Reserved.